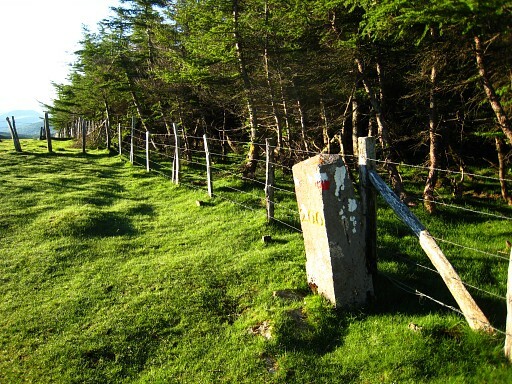 Only the bordermarkers along this stage are shown (and some adjoining ones). 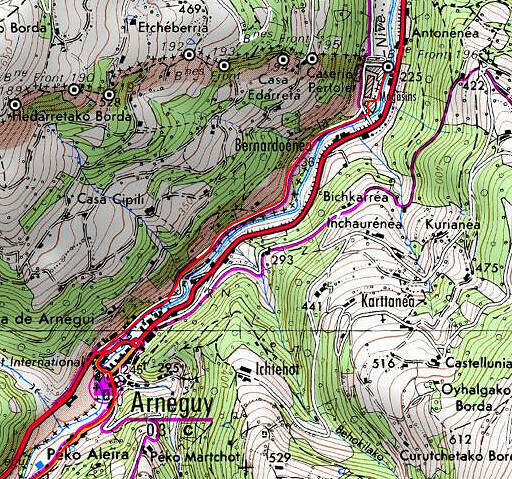 The main route is red, the variants have other colors. 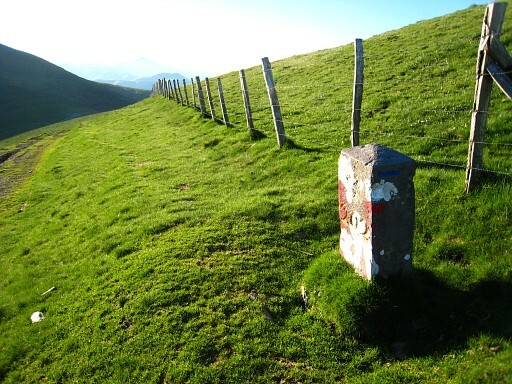 The main route provides a smooth on-going route along most bordermarkers, the variants give access to the remaining bordermarkers. See the GRPdesBF-principles. Click here for an fullscreen interactive map. A rather long stage with few wayfinding issues. 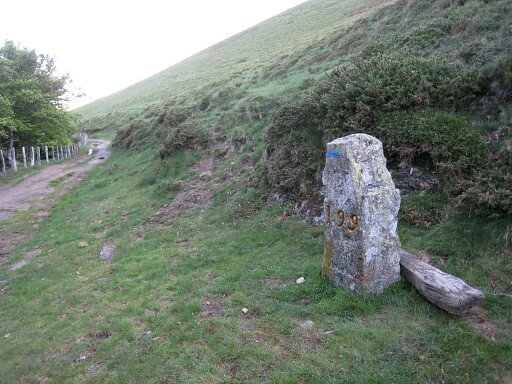 The first 8 km is on easy roads S along the Nive-river, using the waymarks of the pilgrims's trail to Santiago de Compostella (the "Camino"). 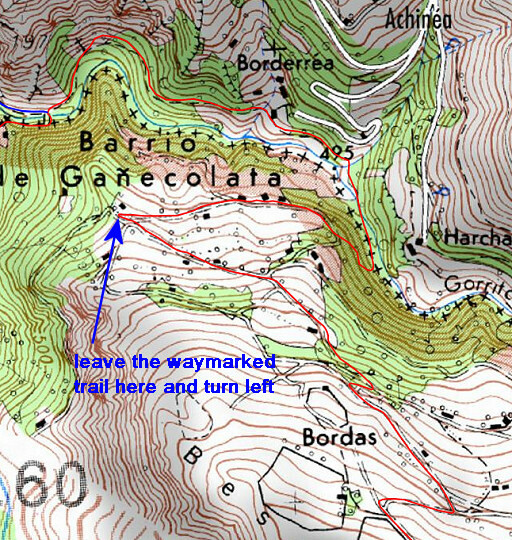 In the hamlet of Gainekoleta we leave the pilgrim's trail climbing SE uphill - partly off-trail - to bm198. Then - again on dirtroads - the main route finds its way to bm212. The three variants need a bit more directions. Water supply is not a big issue until bm200. There are some streams and just beyond bm199 there's a last source. At bm212 there's a cabin to sleep/shelter but there's no obvious stream or source nearby. 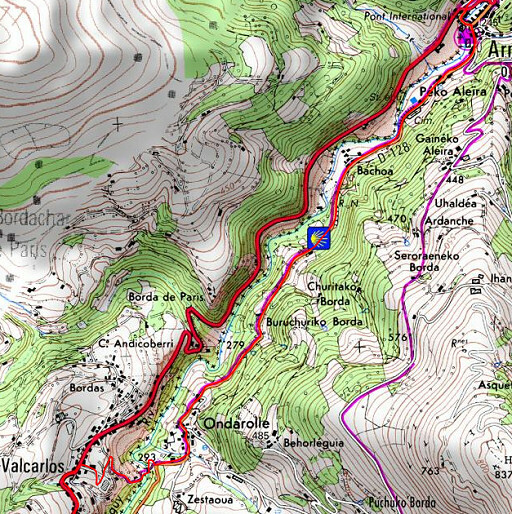 The next watersupply might be at the stream of Harpéko Arreko, a few kilometers to the SE. A bivouac is not really an option before the hill-climb to bm198. 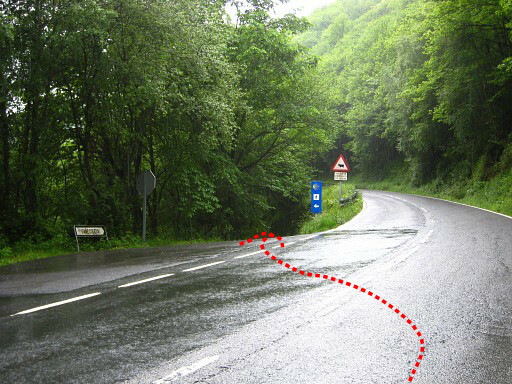 - time according to Naismith's rule with average speed 4km/h; 10 min. extra for every 100m ascent and 5 min. 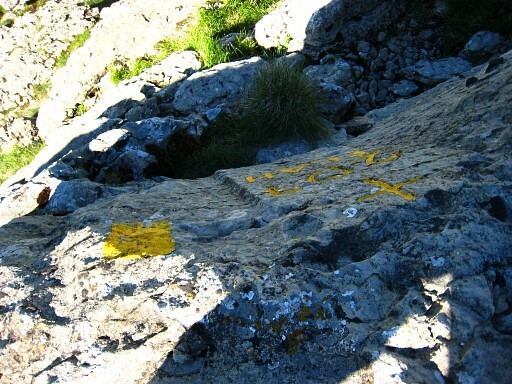 extra for every 100m descent. Don't forget: this is a rough estimation. You might check the relevant webpages in the 'All markers'-section. They provide more pictures of the bordermarkers and additional information on them. 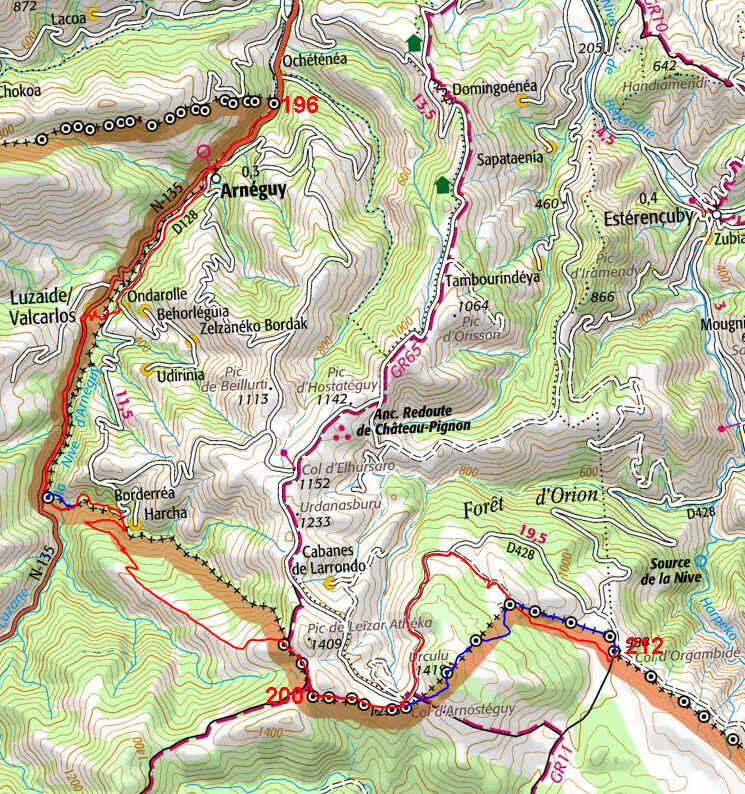 It's easy to print your own - custom made - maps with the GRPdesBF-route and the bordermarkers on them. 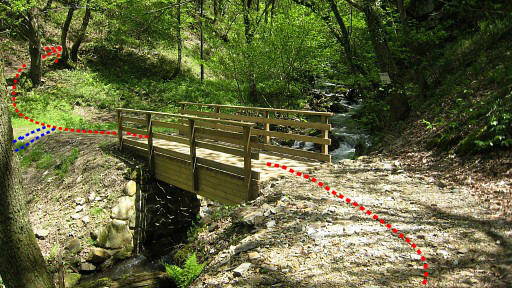 Your starting point: the small bridge at the ventacomplex 1,5 km N of Arnéguy. If you need to shop, you'd better take your chance here though Arnéguy also provides some venta-shops. 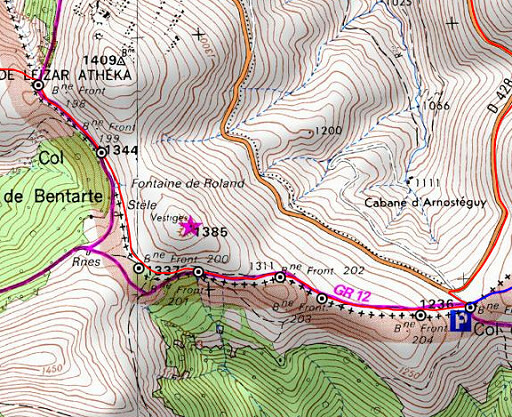 Now - from the S-side of the venta-complex - follow the 'Camino'-waysigns, taking a dirtroad on the W-side of the river to Arnéguy (=1,5 km). 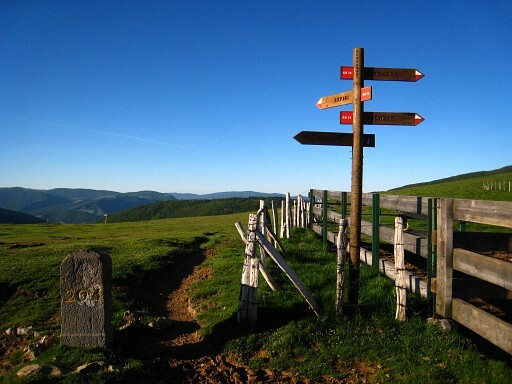 NB: this is an alternative route of the Camino in case of bad weather. 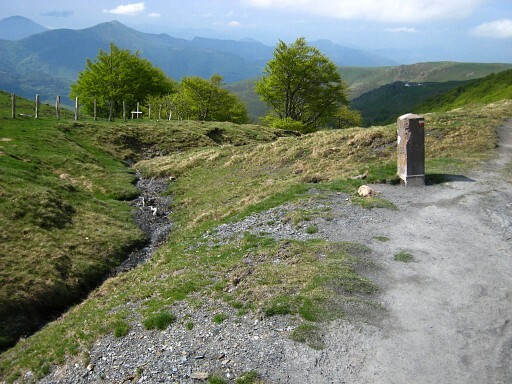 The 'official' Camino climbs to the E through the mountains from Jean-Pied-de-Port to Roncesvalles. In Arnéguy, pass through the village and continue on a tarmac road on the other side of the river (still on the 'Camino'). 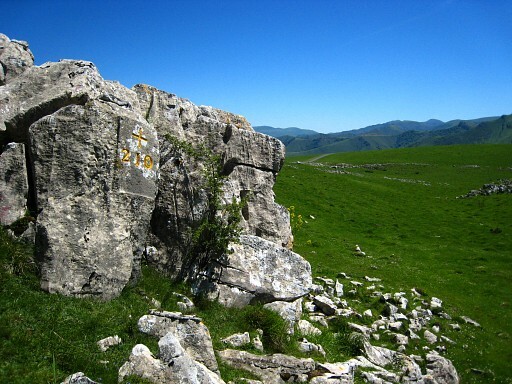 At the hamlet of Ondarolle, descend to the river and climb to Valcarlos. Distance Arnéguy - Valcarlos: ± 3 km. Ondarolle is interesting in terms of borders: the inhabitants attend the church in Valcarlos (Spain) and bury their dead on its cemetary. It's a sort of ecclesiastical pene-enclave. In Valcarlos you have to join the busy road (N-135) to proceed S for 2,5km. There's no alternative. There's heavy traffic here, be careful. 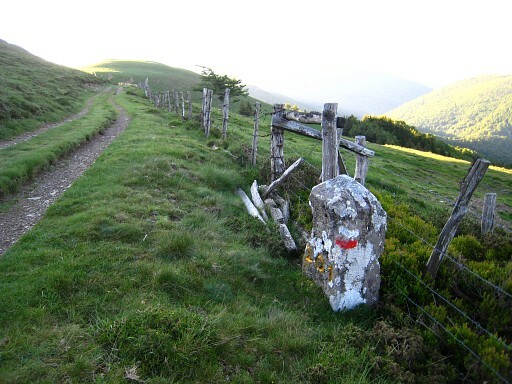 After ± 2,5 km, the 'Camino' goes left, descending on a minor road to the tranquil hamlet of Gainekoleta. That's here. After 750m you arrive in the hamlet. 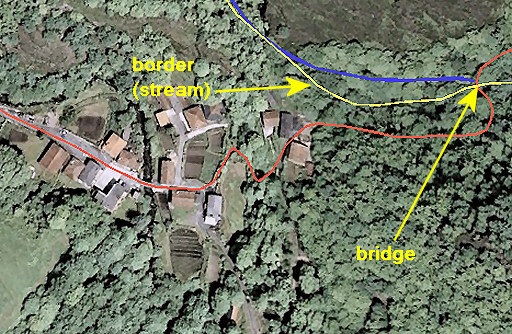 In Gainekoleta, we pick up a local waymarked trail that climbs to the highest house of the hamlet and brings us to a bridge over the borderstream. 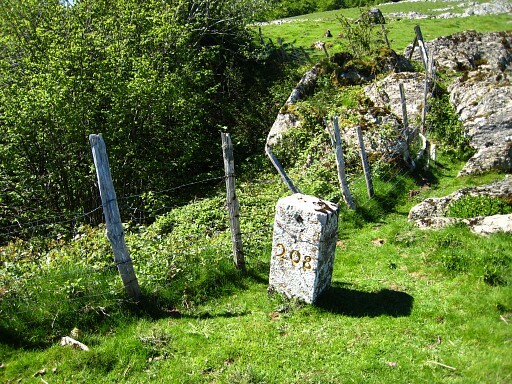 It's a waymarked (green-white) hiking-trail of 2,5 km starting and ending at the hamlet. It crosses the borderstream Gorritchoneka Erreka twice and returns south of it to the hamlet. We use a large part of it. This is the footbridge over the borderstream. On the other side is the starting point for variant 1, going hence & forth to bm197. From the bridge - on the French side of the stream - walk W-SW along the stream. It's a trail which goes underneath a steep rocky hillside and ends at a meadow besides the river. 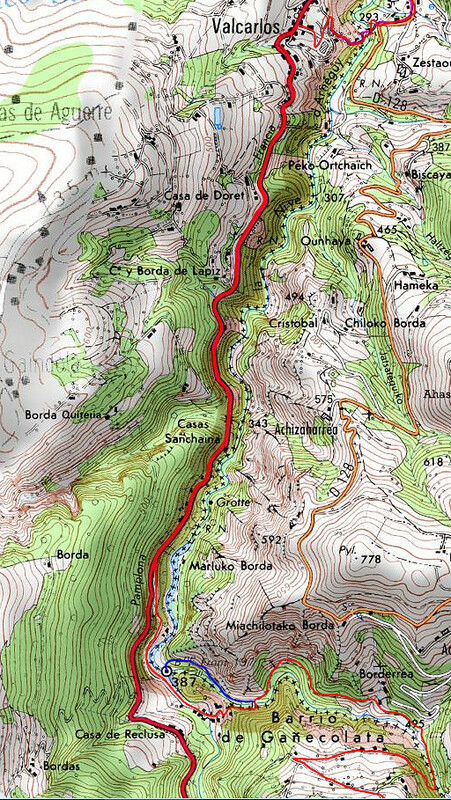 NB: you can see on this map that you can also reach bm197 more directly by crossing the river Nive earlier on the route, provided the waterlevel is low enough. 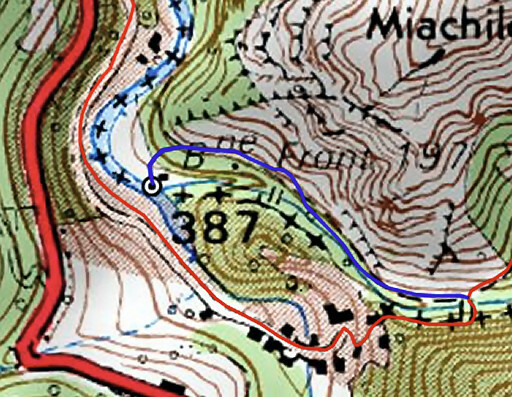 Once arrived at the meadow, go a bit to the left and arrive at the confluence of the borderstream Gorritchoneka Erreka with the river la Nive. That's where bm197 is. 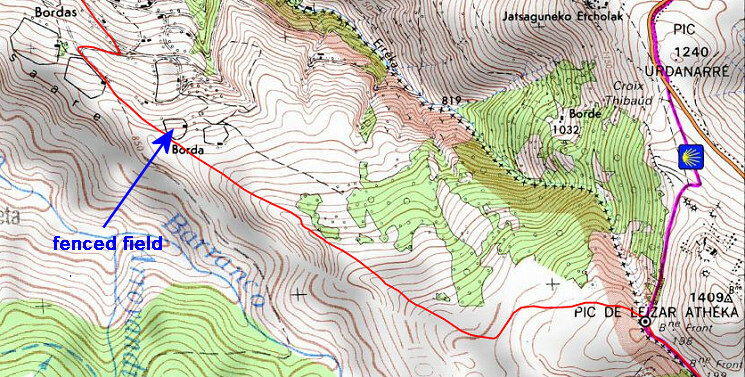 The main route continues on the waymarked trail along the borderstream uphill until it crosses the stream again and turns NW-W to climb to a plateau. 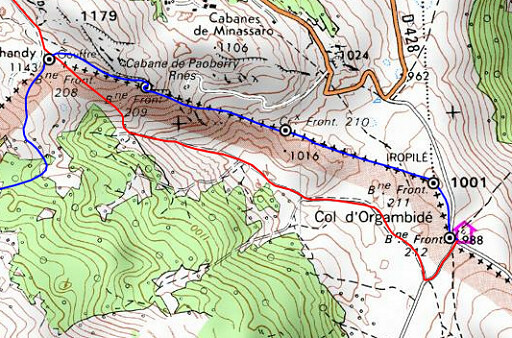 At the W-side of the plateau, you have to turn sharply left (AND leave the waymarked route which descends back to the village). Now keep an eye on this map and the next one. 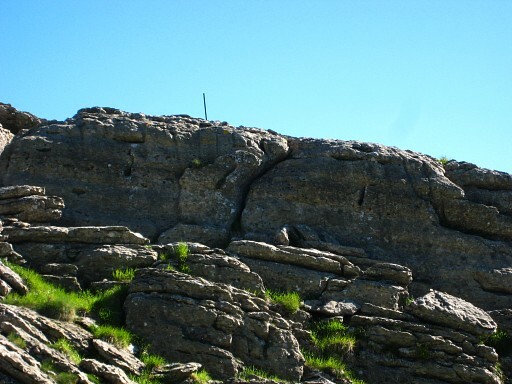 In general you climb SE along the ridge to bm198. 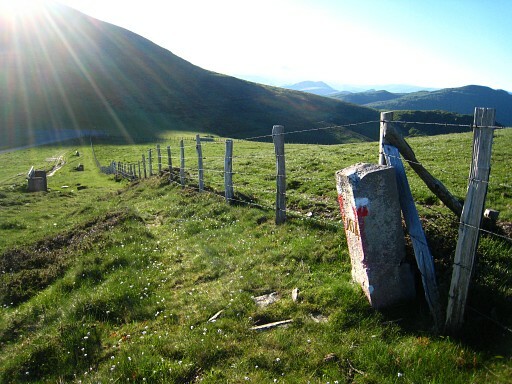 First you will follow a dirtroad which climbs through a forest to a sort of plateau with meadows and barns. 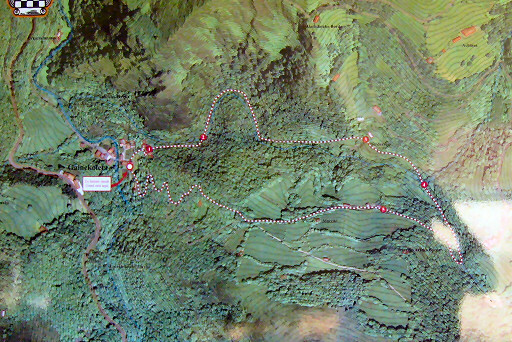 Navigating is straightforward: follow this dirtroad as long as it climbs and you will arrive here. Further on, the dirtroad is going to descend towards a fenced field. 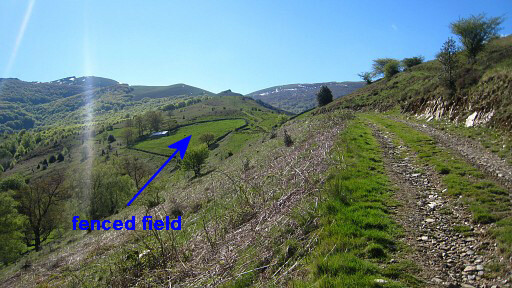 When arriving at the fenced field, leave the dirtroad and continue SE on the hill-ridge. Later on a forest appears at the left hillside, remain halfway between ridge and forest. 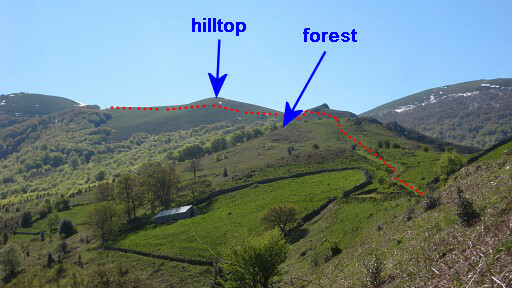 In the last part, the route bends NE->E, leaving a hilltop to your right. 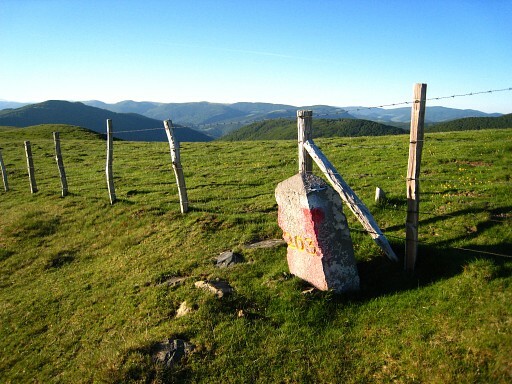 In the end you will reach a fence with on the other side: bm198 and a dirtroad. 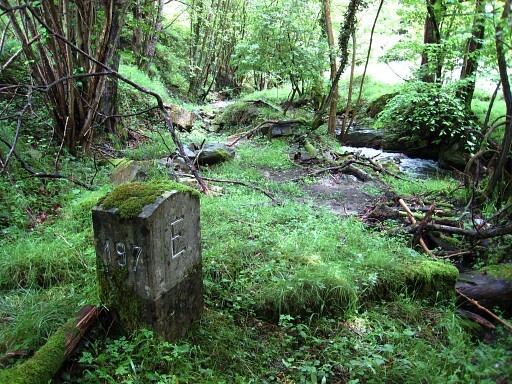 Bm198 with the beginning of the borderstream Gorrichaneka Erreka which merges with the river Nive at bm197. 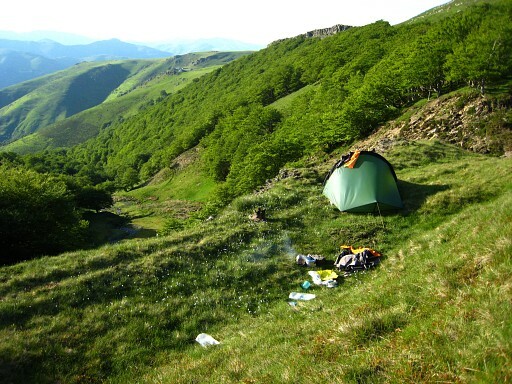 I once camped here with a nice view down the bordervalley. About 600m SE along the dirtroad there's a source. Now continuing SE-E along dirtroads, you will pass along bm199 to bm205. 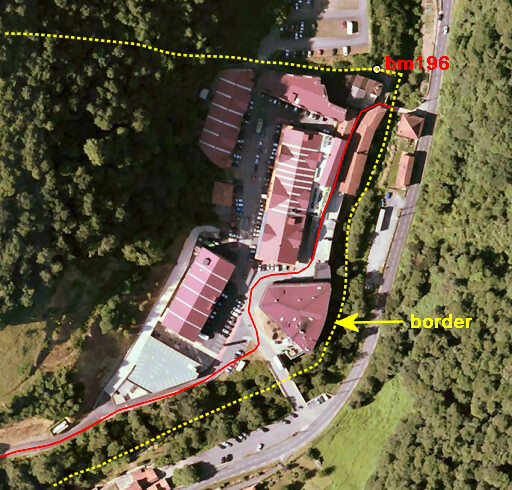 From bm198 until bm199 we join the ''official" Camino-route from Jean-Pied-de-Port to Roncesvalles. 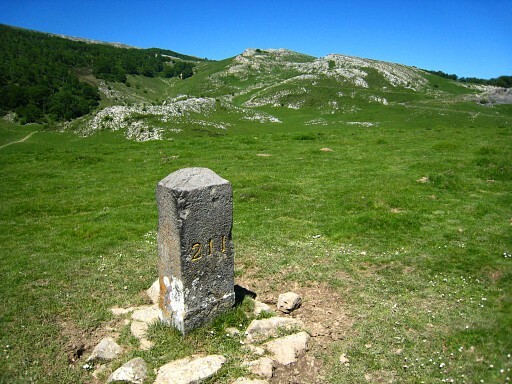 At this point take the branch of the dirtroad which starts here and runs parallel of and a bit higher to the Camino. 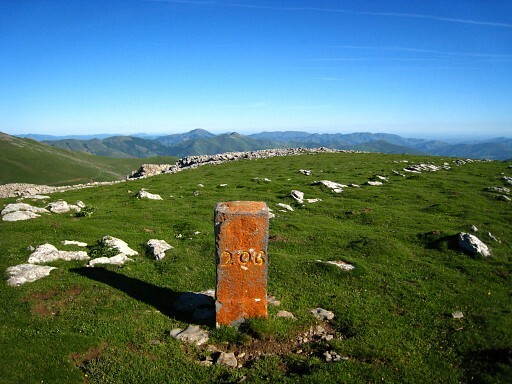 Our trail passes just above the source (Fontaine de Roland) and then heads SSE while the Camino bends SSW-SW. 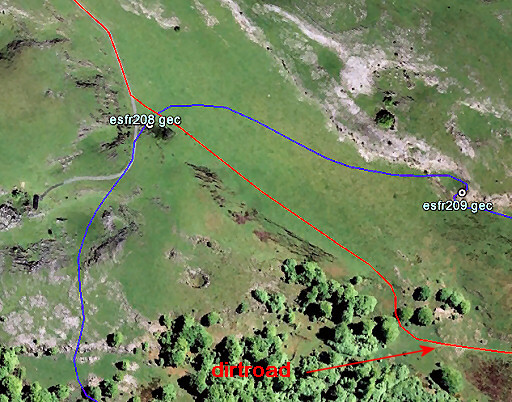 When 'our' dirtroad bends SE-E bm200 is about 20m to the right of the dirtroad. 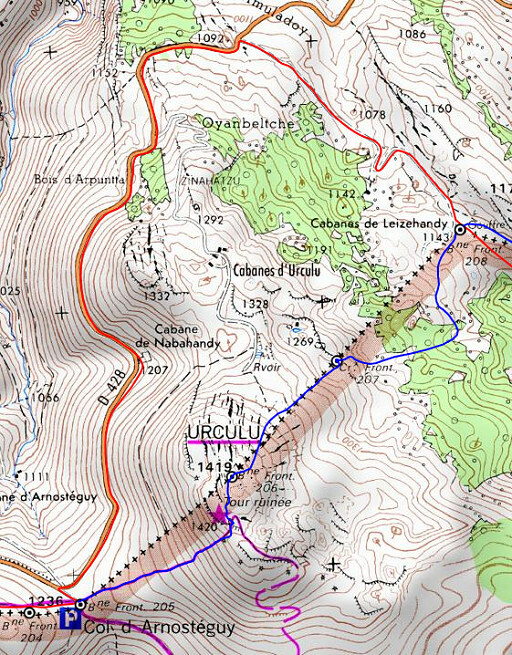 The main route now makes an easy halfcircle on roads to arrive after ±4 km at bm208. At the top, you will arrive at the ruins of tower, you can't miss it. Bm206 is then 150m to the NNE. 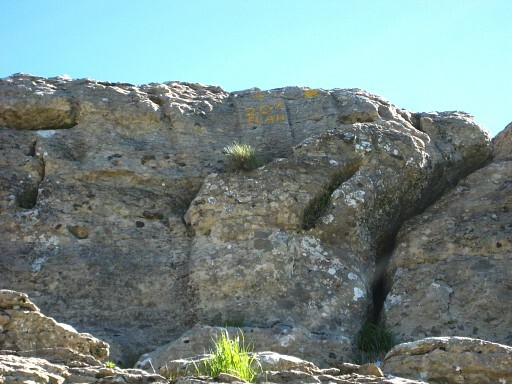 From bm206, descend NE for ± 600m towards a distinct long rock-ridge. There may be still a metal pole placed above bm207 to guide you. More to the left , you can climb to the ridge. 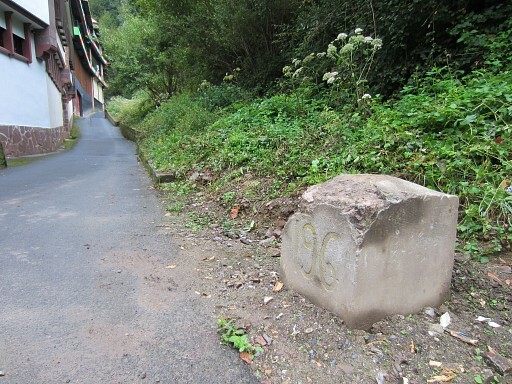 From bm207, there's no straighforward route to bm208. You have to traverse through the forest strip somehow. The route on this map is kind of suggestion. 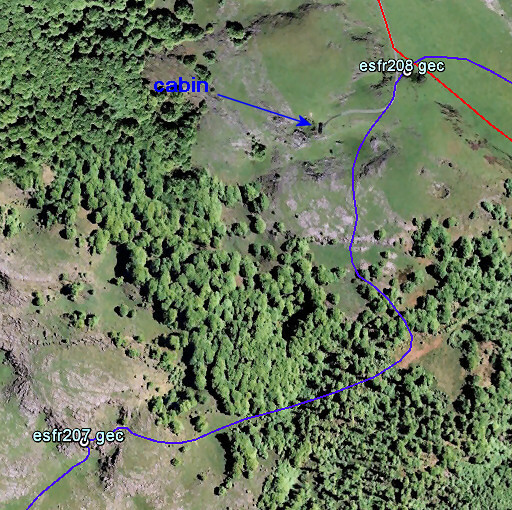 A cabin - 55om NE of bm207 - might help you in your navigation. 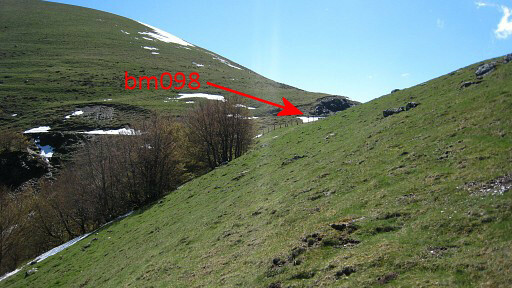 Bm208 is 150m NE of the cabin, besides a mysterious deep hole. Then you are back on the main route. Bm208, besides a mysterious deep hole. 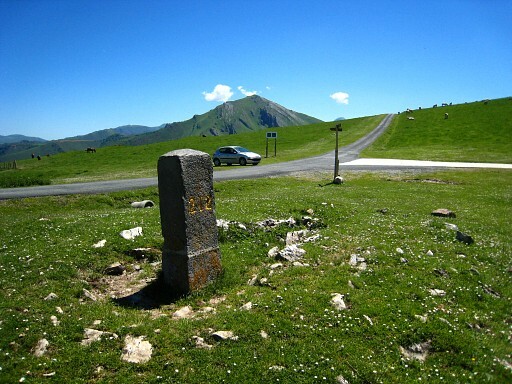 The main route first descends on the grass SE untill it reaches a dirtroad after 400m. Let's show that beginning better. 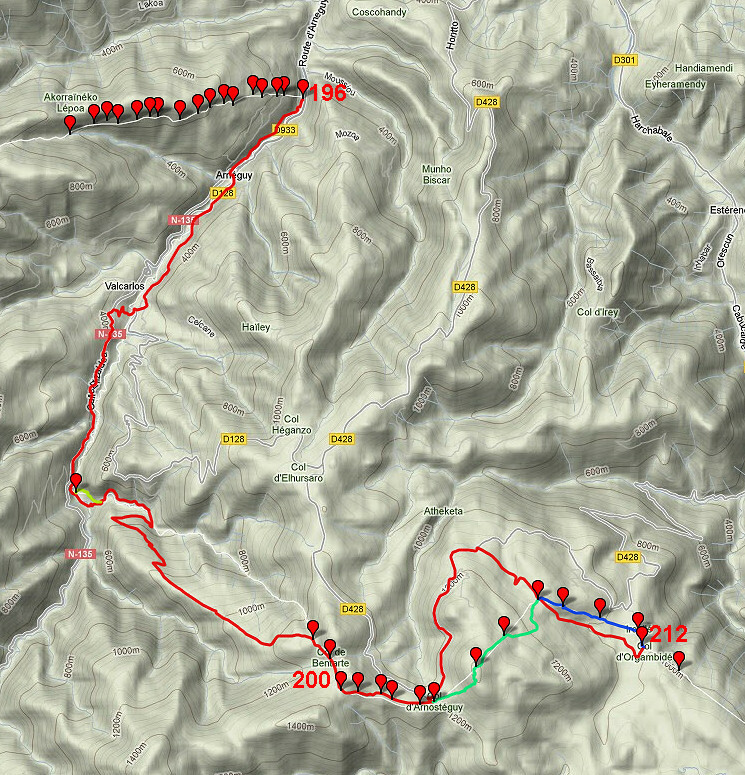 The main route then continues SEE for 1,2km on that dirtroad through a sort of valley. The dirtroad ends at a tarmac or concrete road. Then turn left to proceed in 200m to bm212. 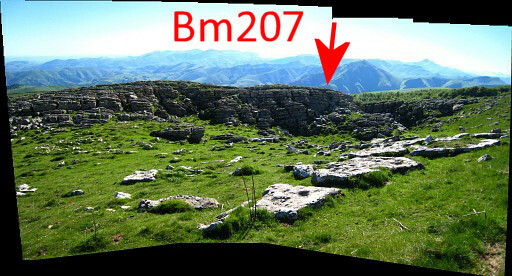 From bm208, go SEE towards a ridge and go underneath it. 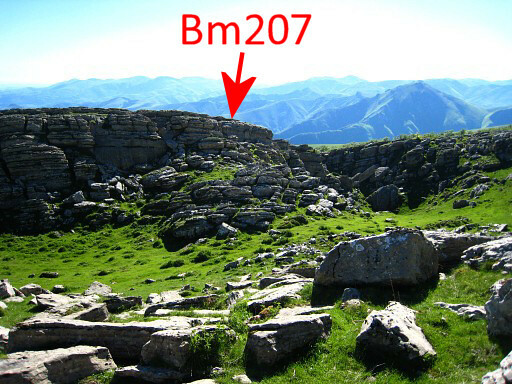 Then climb up the ridge towards bm209. This picture: bm209, looking back. 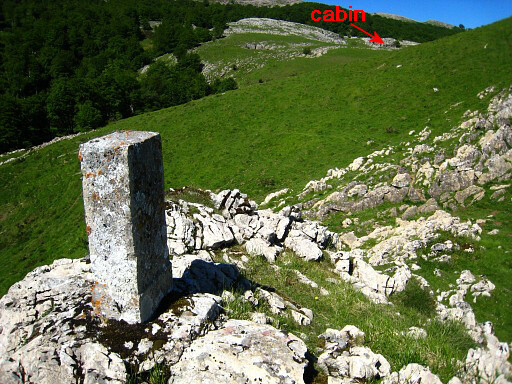 Distance to cabin: 500m. Now continue SEE. Bm210 is 550m further. 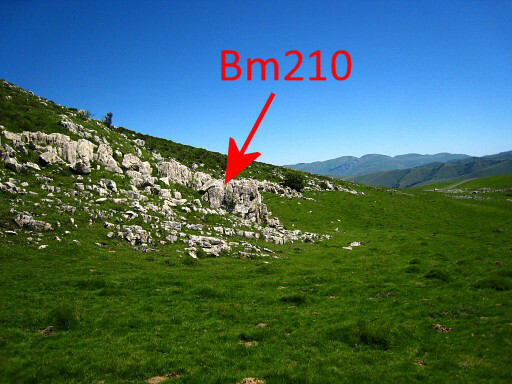 Bm210 is located N of a grassy 'valley' against a rockwall. bm211 which is easier to find in the open field. 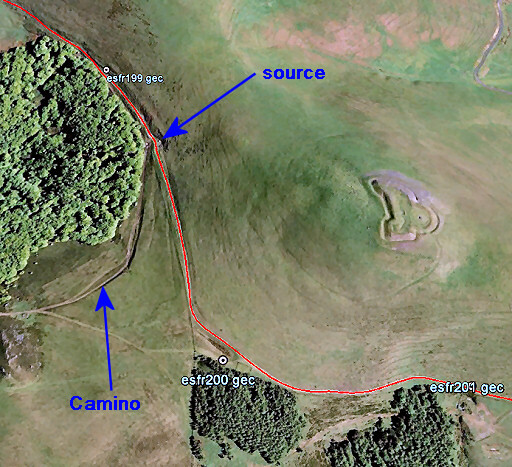 Then bend SSE and arrive in 200m at bm212 and the main route. There's a cabin 50m NE but there's no water available at this plateau.